The city of Calais (the local pronunciation rhymes with “palace”), situated midway between the equator and the North Pole, was an important lumber port in the nineteenth century. Maine’s first railroad, the Calais Railroad, chartered in 1832, carried lumber from a mill on the St. Croix River two miles to Calais. Today, although its population is less thanunder 4,000, Calais remains the center of regional commerce. A light was needed at this place to enable the steamers, plying between Eastport and Calais, and especially towboats, to make the difficult turn at the Narrows, a few hundred yards above Whitlock’s Mill. The Canadian Government maintains two lights on the left or Canadian bank of the river, and another light was needed on the right or American bank to make the navigation safe at this difficult turn. By 1902, the light was displayed from a post. A proper lighthouse and keeper’s dwelling were finally constructed in 1909–10. 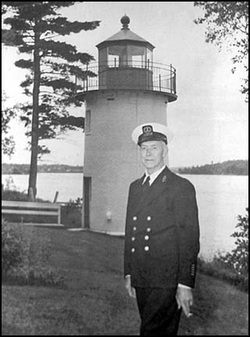 The lighthouse is named for a local man, Colin C. Whitlock, who tended the lantern that preceded it. Whitlock also owned a mill nearby, hence the name “Whitlock’s Mill.” Local legend has it that his wife often had to tend the light, as Whitlock was said to drink to excess on many an evening. The new round brick tower had a fourth-order Fresnel lens exhibiting a green light. The interior of the 25-foot-tall lighthouse is lined with white ceramic-faced brick, a distinction shared with very few lighthouses. The tower was painted red until 1914, when it was changed to white. 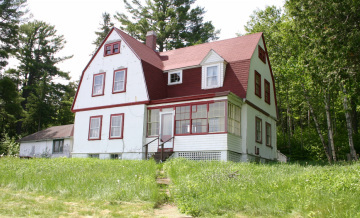 The L-shaped, one-and-one-half story, wood-frame dwelling, about 100 feet from the tower, has seven rooms. 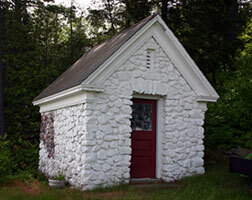 A small oil house was built about 300 feet from the lighthouse. The first keeper, Frank N. Jellison, stayed until 1920. Jasper Cheney, keeper at remote Libby Island for 16 years, came to Whitlocks Mill as keeper in 1949. Right: Keeper Frank Jellison, courtesy of Joan Jellison. “It was the first land station he had been assigned to where we could all live together all year long,” his daughter, Ella Cheney Robinson, later wrote. Ella’s wedding, as well as the wedding of her brother, Roland, took place at the light station. Jasper Cheney retired from the Lighthouse Service in 1957 because of poor health. Among the last Coast Guard keepers was Boatswain’s Mate Chief Russell Reilly. His young daughter, Kelly, always enjoyed following her father around the station as he performed his duties. She later recalled fond memories of riding through the snow in a sled pulled by her father up the hill to the road to pick up the mail. They would both ride the sled downhill back to the lighthouse. Left: Jasper Cheney, keeper at Whitlocks Mill Light 1949-57. Courtesy of Ella Cheney Robinson. The light was automated in 1969 and the Fresnel lens was removed. In the 1970s, the station was leased to the Washington County Vocational Technical Institute. Under the Maine Lights Program, ownership of the lighthouse was transferred to the St. Croix Historical Society in 1998. The keeper’s house and other buildings are privately owned. The property was last sold in the fall of 2004. 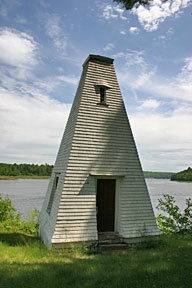 A 1931 pyramidal wooden fog bell tower also survives at the site; the bell from the station is now on display at the St. Croix Historical Society. The fourth-order Fresnel lens is now on display at the Maine Lighthouse Museum in Rockland. The lighthouse remains an active aid to navigation. At present, the grounds are not open to the public. The lighthouse can be viewed from the St. Croix River View Rest Area on Route 1 in Calais. The rest area is announced by a "Rest Area 1,500 ft" sign from the south. The view may be largely obscured by trees in summer. In the spring of 2009, a new VLB-44 LED optic was installed. It runs on solar power.